Delegates rave about the countdowns and the quality of the graphics. We will meet with the client prior to the event to ensure that the questions are structured in the most beneficial way. As part of the warm up process on the day, we train the delegates on the use of the handsets. The system is highly reliable, and we bring 2 laptops to ensure there is no possibility of letting the client down. This is the best audience response system available. 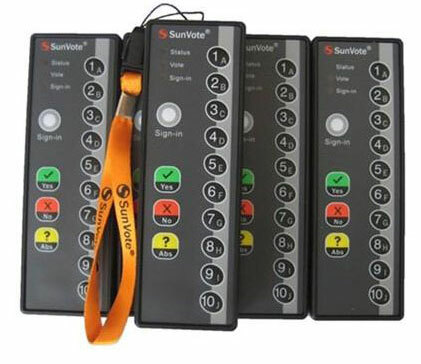 It is the only system that has a full 'mobile phone Style' keypad that lets delegates respond to both 'Open' and 'Closed' style questions using full text and real values. There is instant data collation and display. All response data is automatically saved to a database from where it can be instantly accessed, cross tabulated and amalgamated and displayed. Programming questions is straightforward, just email your questions to us, in word or as PowerPoint slides and we will program them directly into your PowerPoint presentation where and when you want them to appear. When it comes to running your presentation you just step through your PowerPoint slides in the normal PowerPoint way. When you get to a question slide PowerPoint automatically activates the keypads, collects all the responses and displays the results, all you have to do is comment on the results and move on to your next slide, it is as simple as that.